Our 10 easy Halloween decorating ideas are inexpensive, quick to do, and are lots of fun for the whole family. You don't have to spend a lot to have a good time at Halloween as our projects and ideas are made from things you probably already have on hand. 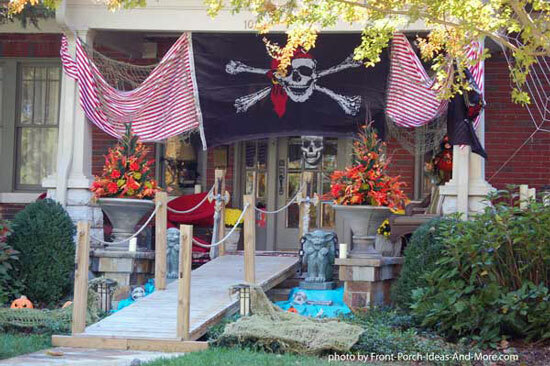 It is a busy time of year and a great time to decorate your front porch or yard. Instead of spending a small fortune on decorations, use these quick Halloween decorating ideas and get the kids to help too. 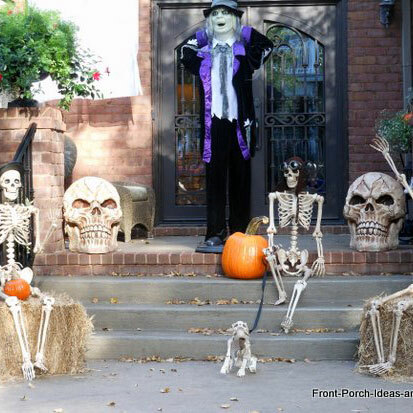 We've gathered 10 easy and inexpensive Halloween decorating ideas you can make for your porch or yard. What variations might you have? We hope these get your creative juices flowing. We've included links to directions and/or free downloads of patterns for certain projects to make it super easy! 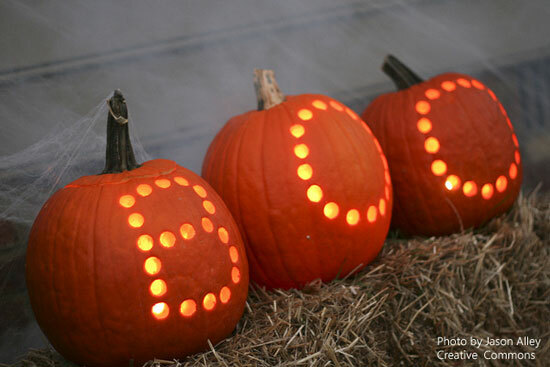 Use indelible ink markers (or paint) to create your own Halloween message. Stack pumpkins and letter them so as to make a word. You could even create an entire message depending on how many pumpkins you use and how they are arranged. Use them to mark a path to your door or arrange on your front porch. If your handwriting is anything like mine, you can use a stencil for the lettering. 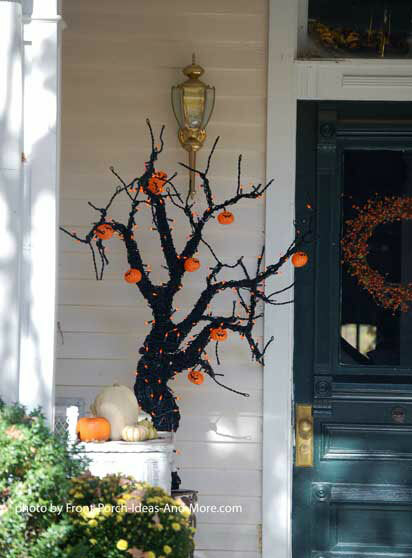 Collect a few branches from around your home or neighborhood and spray paint them black. They are perfect for hanging lights and holiday ornaments. Stick them in a bale of straw, flower pot, or other container. Size the arrangement based on your available space. 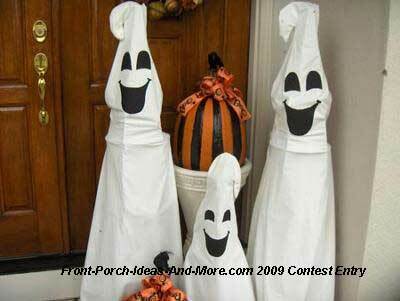 Third of our 10 easy Halloween decorating ideas is ghosts from sheets! You can use 8" pvc pipe to make forms. Cut to the desired height and place a pumpkin on top over which you can drape the sheet. Use makers to make eyes, mouth and any details you like. 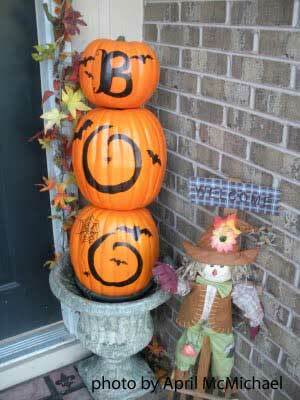 Vary the height and size of pumpkins to create an entire ghost family. 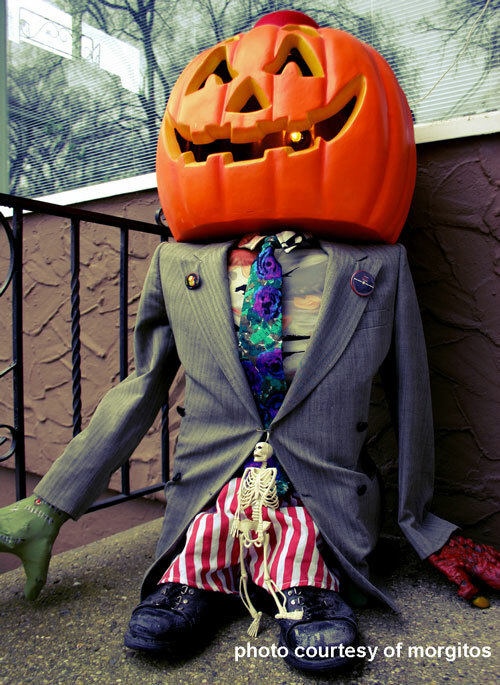 Scour your closet for clothes to create a fun Halloween figure. You can use an inexpensive plastic pumpkin for the head and markers to create the face. You can either stuff the clothes with straw or other materials to form the character. 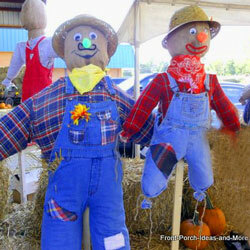 Along the same lines you can easily turn your autumn scarecrow into a Halloween character. Cut a hole in the bottom of the plastic pumpkin so you can place it over the head of the scarecrow. Use scrap wood (or purchase plywood) from which to make grave markers. Square or round the tops of the markers and paint in stone colors like grey or dark brown. Attach a stake to the back of each so you can insert them into the ground. 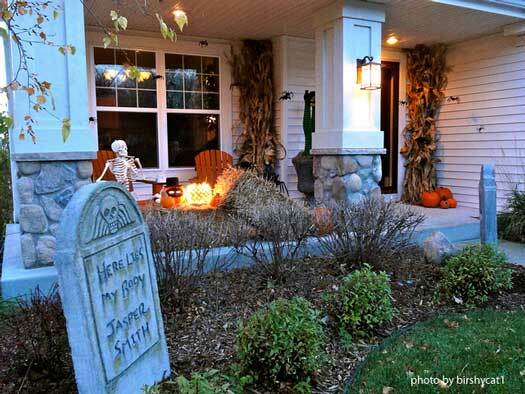 Use paint to inscribe "RIP" or other macabre messages and arrange them in your yard to create a spooky graveyard. Make our black cat, moon, and bat project. 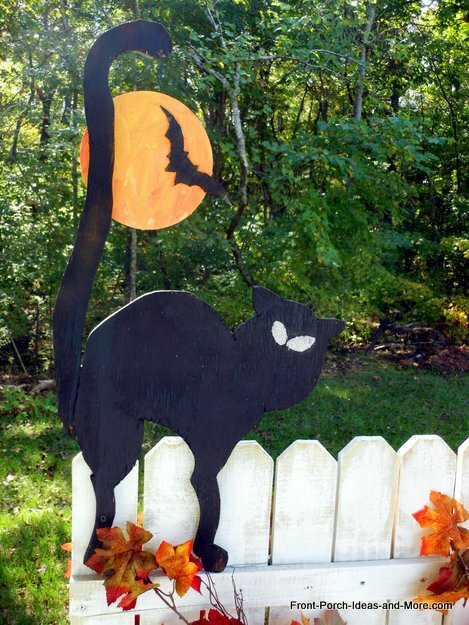 Use scrap plywood to make our black cat with moon and bat. It is easy to make with our free instructions and templates and can be used indoors or out. 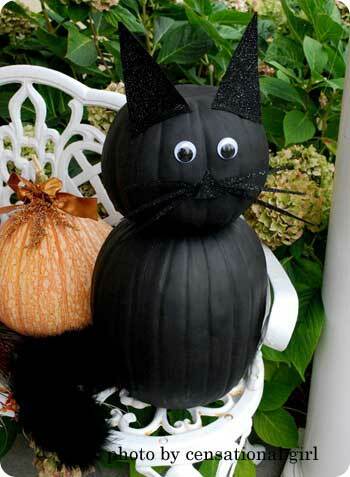 Sketch a pattern on a pumpkin and drill holes to along the pattern lines (after you have cleaned out the pumpkin). Insert lights. Brian, for his pumpkins below, used a wood boring drill bit. Just ensure your holes are large enough to allow sufficient light to shine through. 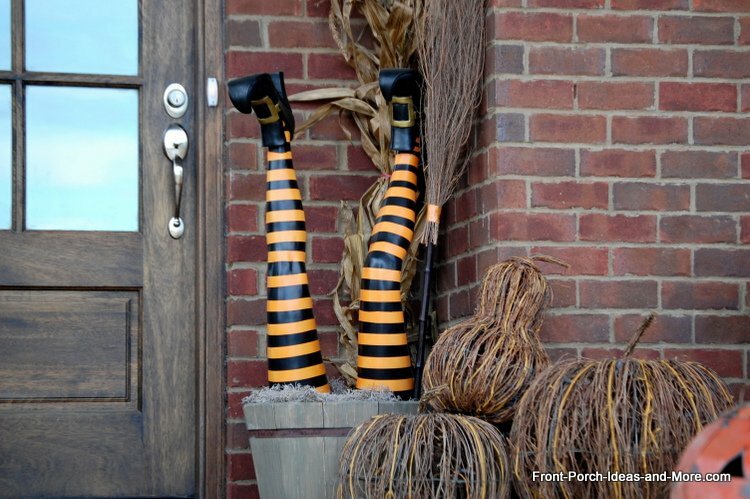 One way to make these is to stuff leggings with straw to make upside down witch legs. Insert a piece of wood into the ends of each legging and stuff with straw or other materials. Place an old pair of shoes on her feet and place them upside down into a flower pot or other container. Another option is to use leg mannequins. Make a jillion bats and hang them all over the place! Karla shows you how. 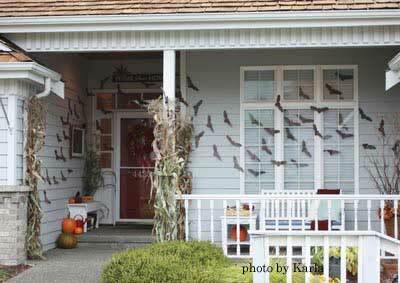 We could not resist adding one more to our 10 easy Halloween decorating ideas list. 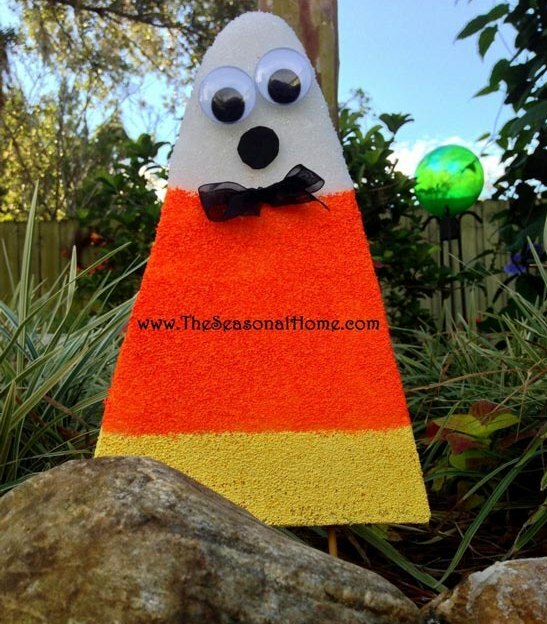 Eileen from The Seasonal Home shares her fun candy corn idea as an outdoor Halloween decorating idea. Eileen uses a sheet of foam (choose your own size). Next, cut and round the top into the shape of a piece of candy corn. Next layout the pattern using candy corn as a guide. Eileen points out the yellow stripe should not be as wide as the orange. She suggests using painters tape if needed and recommends using acrylic paints and a sponge brush. You can either purchase eyes and other ornaments or use black paint. She inserts bamboo sticks in the bottoms for placing in the yard. 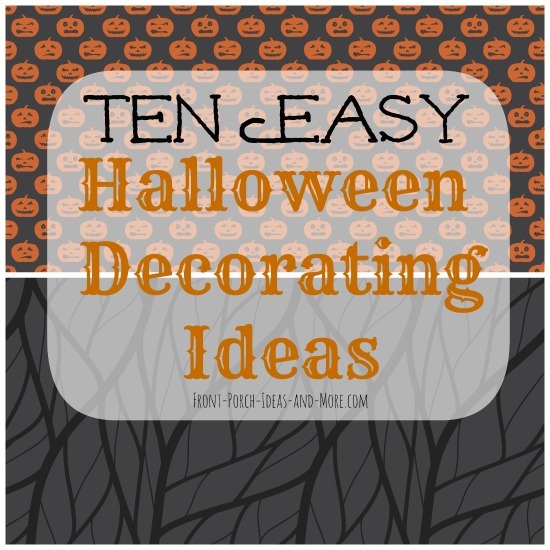 We hope our 10 easy Halloween decorating ideas have inspired you and encourage you to check out our extensive Halloween decorating section.